April 29, 2013. Summer Wine has been sold. 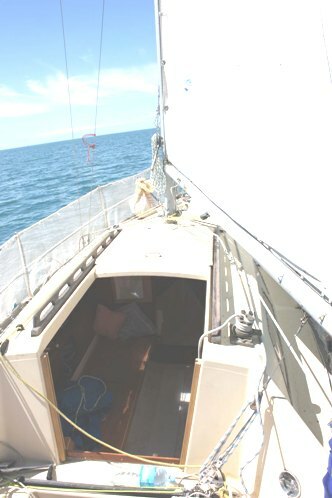 We'll standby for the new owner to check in and wish senior DFI Giles Grinstom "Fair Winds" in his new home - Australia. And, they did! Click here to go there. 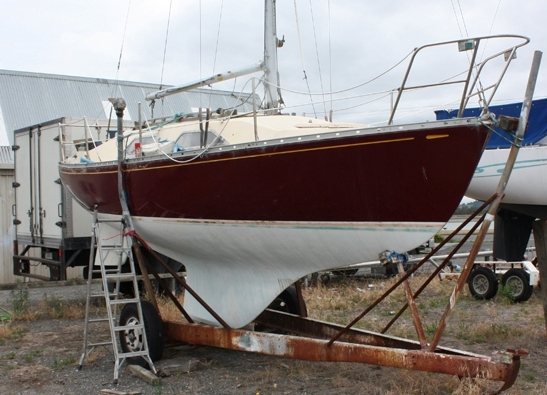 Summer Wine, 24 feet, reluctantly for sale. Boat has all the usual equipment. 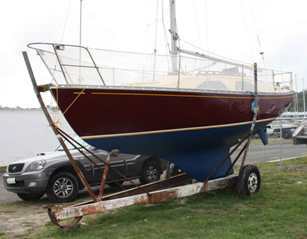 She has not been antifouled since Feb 2011. Keel bolts etc can be inspected. 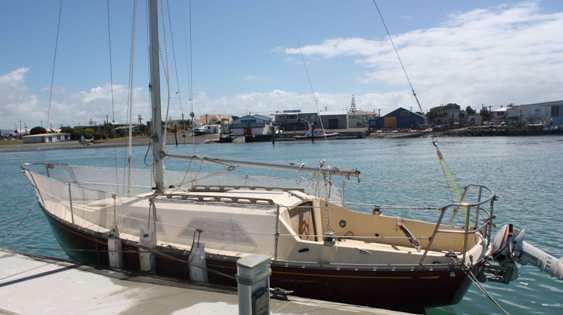 If buyer wants to take her out of the water it is at their expense, see Napier Sailing Club for rates. 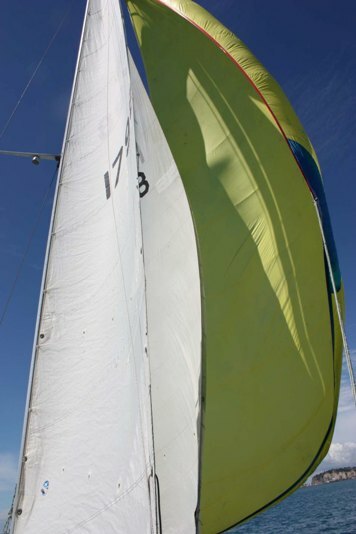 Main, reacher, genoa, 2 jibs, spinnaker, shooter. 2 anchors, chain, outboard etc. We are emigrating to Australia. 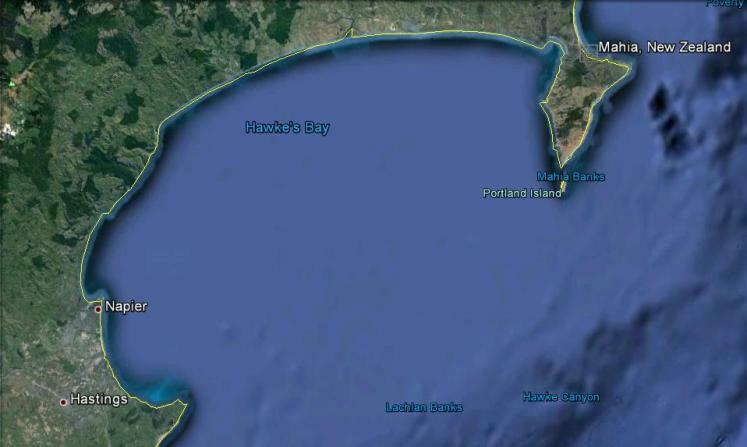 Very informative website www.dolphin24.org see Rosters for NZ boats. Life jackets, flares, loo, boat hooks paddles, radios, 2 batteries, 2 solar panels, beaching trailer. Must be completed within 3 days of closing. The following is the history we have on Summer Wine up to this point. 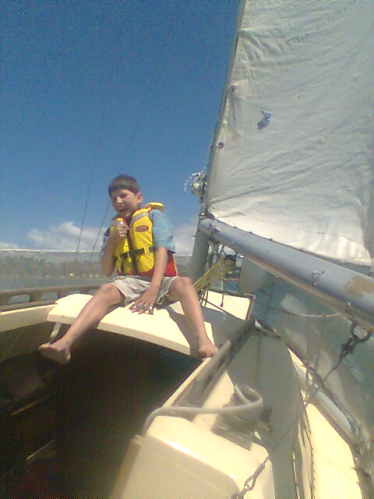 Giles is a senior DFI and helped us get the New Zealand built boats home page better organized. We will miss him. 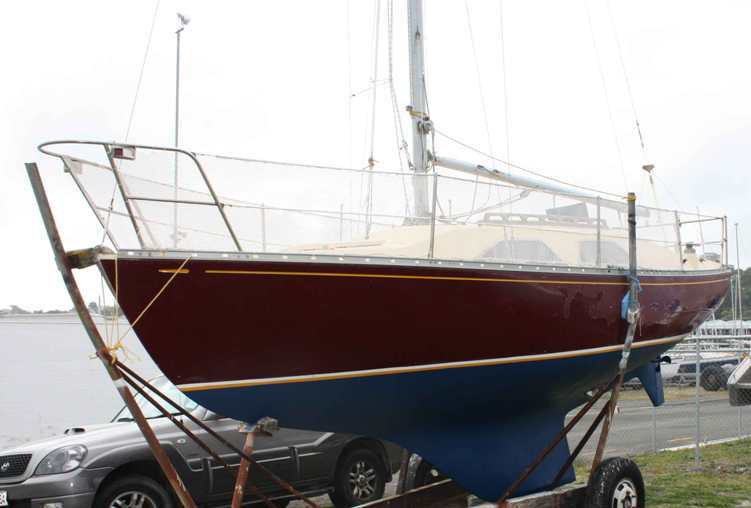 This is the link to the New Zealand Built Boats home page. 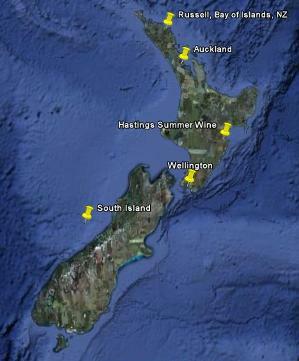 On December 11, 2010 Giles Grimston checked in with the following email, and followed up with photos of Summer Wine. I am the new proud owner of Summer Wine. I am looking to give her a minor birthday and would like to get some advice. She has had a torrid time. She was on the hard and squatters have been living on her. There was more water damage than anything else. I am going to put some photos on the site so people can see before and after. Any advice would be most appreciated. I live in Hastings and have a young family so the intention is to get her to a level for all. 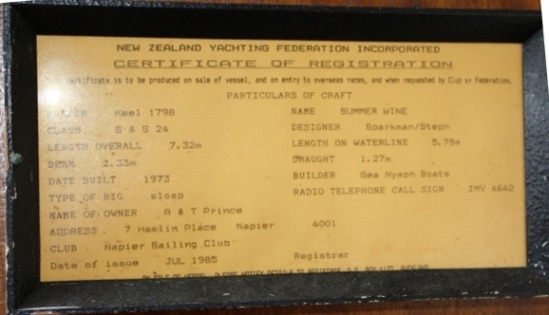 Summer Wine was built in 1973 by Sea Nymph Boats and her owner, when this certificate was issued in 1985, was A & T Prince at the Napier Sailing Club. The Class shown is S&S 24. 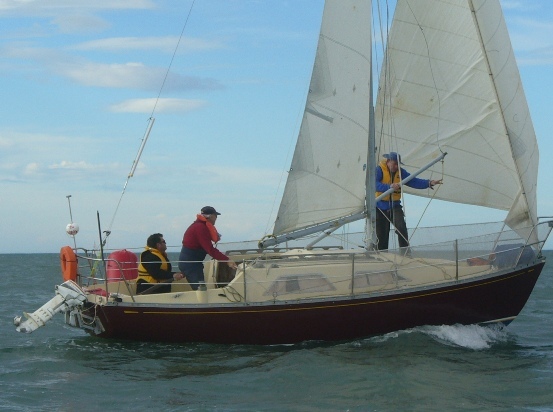 The S&S 24 and the Falcon 24, despite the appearance difference due to the deck house redesign, were essentially the same boat and carried the same racing handicap. For more on both of these versions click here. February 23, 2011. Here's an email and 'ready to go' pictures from Giles. I have attached 3 pics of Madam. She is finally in, I am now waiting for a reasonable day to trial her. What a lovely family boat. I do enjoy your website, thank you! 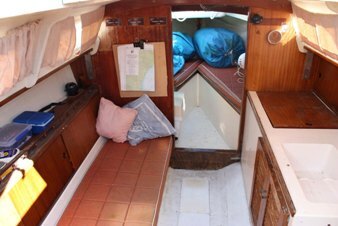 I am going to keep this brief, utterly exhausted after first sail in 10 - 15kts full main no 2 genoa 5 - 5.5kts varied swell. What a super boat. A true joy. I will need to look at the keel again a tear of moisture, sadly salty, appeared after pushing her for a while but worth it. I just had to share this with people who appreciate these works of art. April 2, 2011. Giles sent in a photo, taken by the local newspaper, of Summer Wine doing what she likes to do. 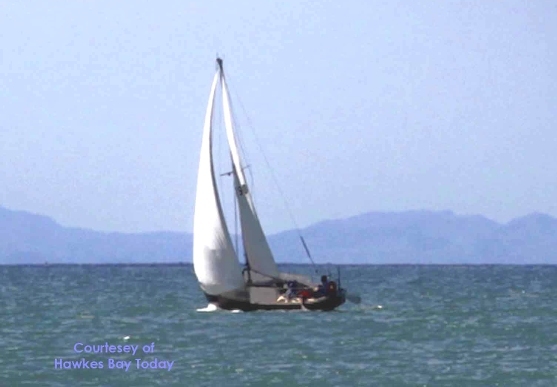 June 22, 2011 - Bettina Grimston sent in a couple of super pictures of Summerwine racing(?) in a breeze. That's a mark just off her stern in the distance - click for larger view - great photo! I had her up to 7 knots today. 3 blokes all 80 odd kg each, clean bum and prop removed. No 1 jenny, full main and I guess gusting 15 to 20 knots full and by. 6 hours WOW !!!! 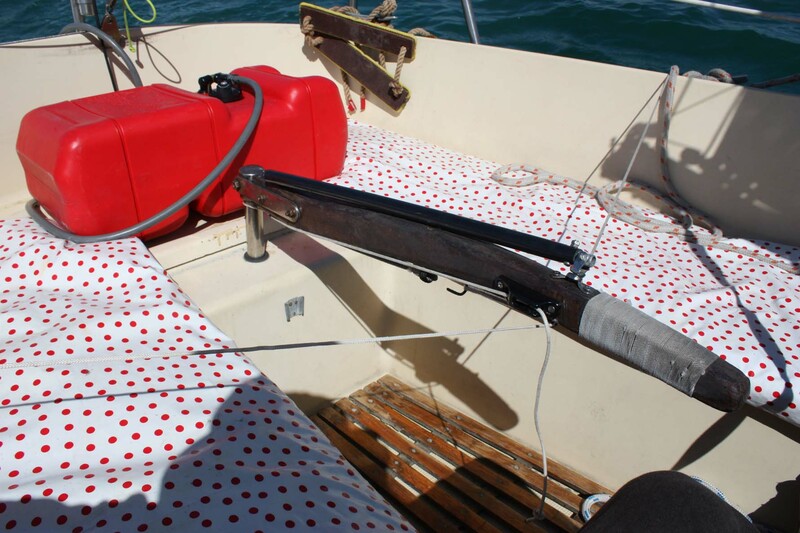 I copied this semi self steering gear from an old yachting magazine. 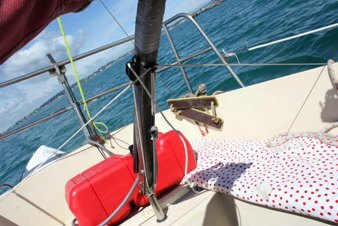 If any one wants the blurb I am happy to provide it but in the meantime bits of shock-cord and pulleys costing NZ$2 and allows me onto the foredeck when single-handed, cheap and cheerful. They hardly need it as they are so easy to balance. Webmaster Note: We have included this in our collection of Tiller Control Systems in the Technical Section/Rudders/Tillers and Related Section. I have just fitted a Cunningham of sorts as we don't have a track and yes it works - 2 pulleys just to tighten the clew, 1 knot more. Very satisfying. In NZ now we are having to get every report going to get insurance coverage after all the claims from earthquakes, so I have included above pics for fun. December 22, 2011. 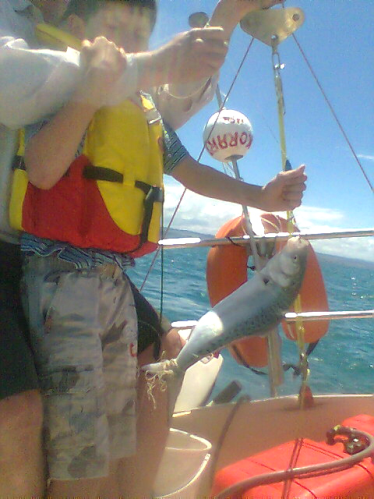 Dolphins love fish, are great at catching them, and love to show kids how to do it. Giles has sent in some proof. First fish ever! A super summers day sail at last. June 4, 2012. 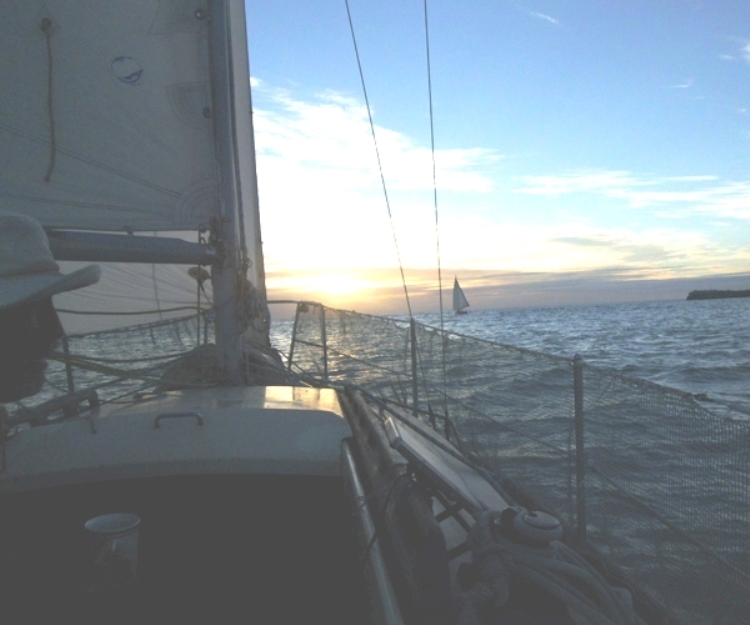 Giles sent in a short update - winter sailing in New Zealand, minor edit. I was out yesterday to clear the cobwebs, it got up to 28 knots with very little swell. 2 reefs and a working jib. She took it in her stride. Not particularly fast, but safe. I like the winter winds - not so flooky. October 13, 2012. Giles went thru a difficult couple of months. On July 31 he advised that Summer Wine was for sale and we posted that ad on this page. Giles advised today that Summer Wine is no longer for sale. He joins that distinguished select group of owners who have gone through a similar "Oh my gosh? What have I done?" experience. The record time for this is 2 days. In order to minimize the often painful reminders of this experience we removed the ad and related text from this page and set up a link for the historical record. If one must, click here to go there. 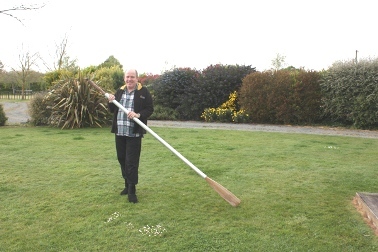 Giles is a senior DFI and helped us get the New Zealand built boats home page organized. We would have missed him. This is the link to that page. 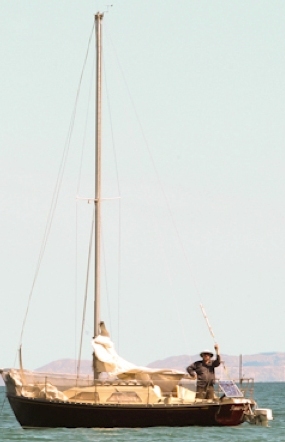 http://dolphin24.org/technical_Dolphin_with_fin_Keel.html. Note the height of the outboard on an adjustable bracket. I lower it to its max in a swell. This is as low as it goes and plenty considering it is a long shaft. The motor performs best when not too deep, but in a swell I get cavitating so put it deeper to stop that disconcerting scream everytime the prop comes near the surface. Speed is best when not too deep. All this assumes the transom bracket is in fact perpendicular which is a big assumption! I have had a wave or 2 over and have to go at an angle through the waves to prevent this. Hard work. I only really use the motor when it is absolutely necessary. They make such a racket and she is so much better under sail in a swell. We get some beuts here after storms but it is awkward when the wind dies on the approaches to the harbor as you get bounce back from the shore as well. The iron sail is really my last resort and so far has not let me down either. Not bad for a 1976 Johnson 9.9hp. January 28, 2013. 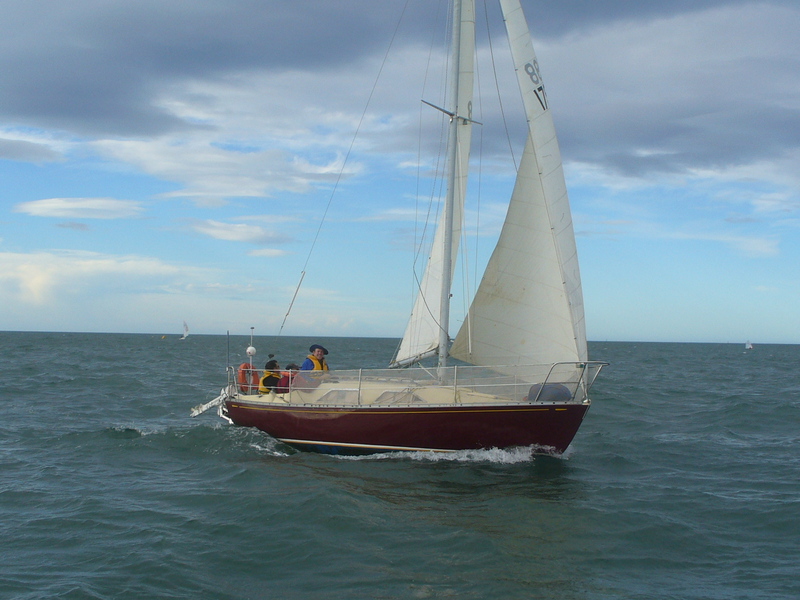 A current project with these downunder boats is to look at sails, in particular working jibs and storm jibs. 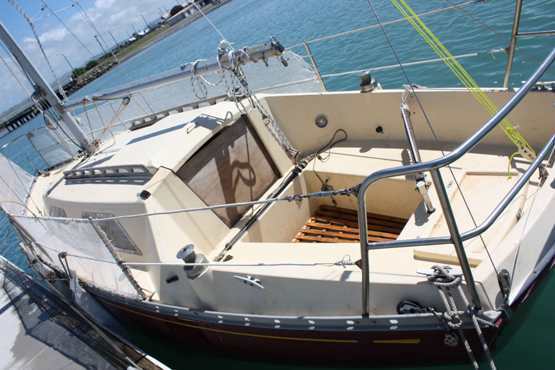 Paul Parsonage, Glass Spider, an S&S 24, raised a question on the Forum about the role that an inner stay might play as a stay for a storm jib. This is a work in progress but this picture and what we have so far can be seen by clicking here. As promised a couple of pics but I forgot to measure. I was out in a big swell 10 to 14 knots, they do like a bit of a sea but you are lucky with a trailer sailor, I am donning the wetsuit and going to scrub. My wife said to be careful when I get out the coastguard might try and push me back in!!!! I notice a drop in performance with the proverbial botanical gardens. After the forthcoming performance I will report back. I am getting a few boats together to try and do a 50 mile single handed across the bay to Mahia during the Feb full moon and exploring sheet fed self steering. I am advised that this best suits long keel boats by one grotty yachtie. Any thoughts? 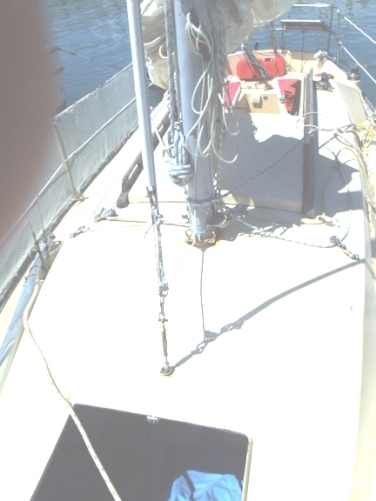 There are quite a few interesting articles online on main sheet and jib sheet feeds but no hull shape is mentioned. February 2, 2013. Giles commented on the benefits of a clean bottom, and single handing with his 'new' self steering gear. They are in the Technical Section. Click here to go there. March 3, 2013. 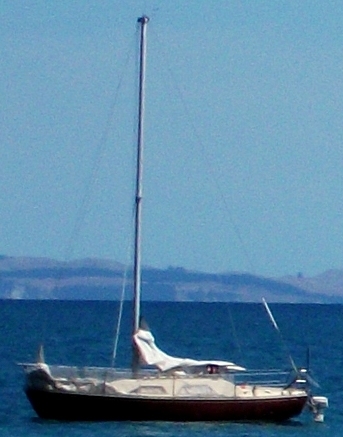 Giles sent in his report on their first attempt of the Hawke's Bay crossing. It remains a goal..
We tried to get to Mahia, left at 6.30 with the sunrise. I refuse to motor for hours on end and by 12 we had made 13nm so with a cloud cover looming, decided to turn round as the place we were trying to get to has nothing but rocks. 23 knots of wind at about 1pm, reacher and full main, magical. I sailed with one of your compatriots and, sadly for my liver, we got on famously and had a splendid day. I dread to think what the week-end would have degenerated into. He said if I thought Hawkes Bay was small town he spent time in Dodge City and regaled me from there. He did his time in Vietnam, great day. The next full moon is Easter and we are considering early down payments to the Memsahibs of the house to get time off. March 10 and 17, 2013 - updates on Summer Wine's auto pilot system - Click here to go there.